The Norwegian motor ship Pleasantville which was sunk by U-135 under Kapitänleutnant Friedrich-Hermann Praetorius 190 nautical miles northwest of Bermuda on Sunday the 7th of June, 1942. Two lifeboats on either side of the funnel are clearly visible. The radio aerials would have been strung between the masts. The “K” on the funnel stands for A. F Klaveness & Company D/S A/S. of Oslo, the ship’s manager. The Norwegian motor ship Pleasantville was built by Burmeister & Wain’s Maskin & Skibbsbyggeri of Copenhagen, Demnark as hull #565, and delivered in December, 1929. Her owners were Skibs A/S Mandeville and her managers were A. F. Klaveness & Company D/S A/S of Oslo. In April 1940 ownership was transferred to the Norwegian Shipping & Trade Mission, or NortraShip. The ship was 4,549 gross tons, and could carry 8,311 deadweight tons of cargo. She was 391.4 feet long, 55.2 feet wide and 24.4 feet deep. She had two diesel engines which turned two propellers and produced a speed of 13 knots. It appears from Norwegian National Archives documents (Warsailors.com) that Pleasantville spent 1940 and 1941 in the Pacific Ocean, plying between Singapore, the Philippines, San Francisco, Indonesia, Seattle, Vancouver, Tacoma, etc. She returned to the Atlantic by voyaging from Colombo via Cape Town to Trinidad, where she arrived on the 30th of March 1942. She arrived in New York on the 10th of April and appears to have stayed for a considerable time – nearly seven weeks – presumably loading a complex cargo of war material. On her final voyage the Pleasantville loaded 3,000 tons of phosphates, cars, and trucks. There were also airplanes in crates on the decks of the ship, as were two locomotives along with their tenders. 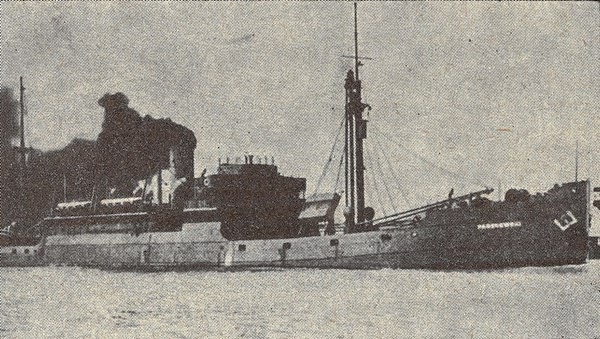 The charterer was Fearn Line of New York and her destination was Alexandria Egypt, where the cargo was intended to help the Allies push back General Rommel, the Desert Fox, in North Africa. Pleasantville set course for Cape Town, where she intended to take on bunkers and perhaps food for her crew of 37 and ten passengers, who were officers in the US Army. The Pleasantville was armed with a 4-inch gun, two 50-calibre machine guns and two 30-calibre machine guns. The gunners listed among the crew were Guttorm Thorsen and Hans Dahle. 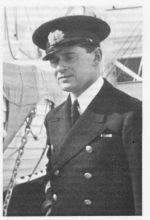 Pleasantville’s Master was Captain Johan Wildhagen of Norway. He was supported by Chief Officer Kare Rødnes, Second Officer Kåre Jensen, and Third Officer Karl Utseth, aged 51. Though most of the officers and crew were Norwegian, Mess Boy Robert Nicolay was British, Mess Boy John Laxio and Radio Operator Wallace Stevens were Canadian, and Saloon Boy Constantin Belios was Greek. Pleasantville left New York Wednesday the 3rd of June, and used the Ambrose Channel to get to the Delaware River. On the 4th of June it transited the Delaware River to the Chesapeake Bay, where it anchored Then it made for Cape Henry, where it anchored again. At 5:30 am on Saturday the 6thof June the ship set sail from Cape Henry for Cape Town. By the evening of Sunday the 7th of June 1942 she was 190 nautical miles northwest of Bermuda and 375 nautical miles east-southeast of Cape Hatteras. This was 475 nautical miles southeast of New York. On the evening of the seventh the ship was on course 126 due southeast, making twelve knots. The seas were smooth, there was a breeze from the southeast, and visibility was good at dusk. There were two lookouts on duty – one on the bridge and another in the crow’s nest. Able Seaman Konrad Sandtorv was at the wheel at the time. The ship was not zig-zagging, as Captain Wildhagen had stopped zig zagging at 7 pm and was planning to resume at 8 pm. Kapitänleutnant Friedrich-Hermann Praetorius brought U-135 to the region west-northwest of Bermuda on the 6th of June, 1942. Praetorius was born in Kolberg in 1904, making him one of the older skippers to patrol the Bermuda region. He was a member of the Crew of 1934 and joined U-boats in April 1940. After serving as First Watch Officer on U-98 until May of 1941 he began commissioning U-135, in which he led four patrols of 208 days up until November, 1942. U-135 sailed from Brest on the 26th of April 1942 for the 7th U-boat Flotilla. The U-boat was part of the sixth wave of boats to attack the US coast in Operation Drumbeat. There were thirteen boats in that particular wave. At 8:42 pm local time on Sunday the 7th of June (50 minutes after midnight on Monday the 8th German time), Praetorius sent a torpedo into the port side of the Pleasantville by way of cargo holds 2 and 3. It made a muffled sound, suggesting that it had hit the phosphate, and blew a hole in the port side. No emergency radio message was sent as the masts had fallen down, and the guns were not manned. The engines were stopped from the boat deck. After the first missile the men abandoned ship “immediately,” minus two casualties, in three lifeboats. Captain Wildhagen threw the confidential ship’s codes over the side in a weighted bag. The two men who perished were Third Officer Utseth, who had been on the bridge, and Able Seaman Magne Hansen, who was a lookout on the boat deck and was hit by shrapnel (possibly he was in the crow’s nest). After the men had rowed clear of their vessel, Praetorius sent a second torpedo into the Pleasantville twelve minutes later, at 9:02 pm. This one hit closer to the water line than the first. It was fired from a quarter-mile away at an angle of 25 degrees from the port side, aft. It penetrated the engine room, wrecking it and sealing the ship’s doom. 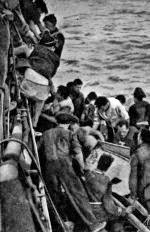 Shortly afterwards U-135 approached the lifeboats and questioned the 45 survivors. Praetorius spoke in German and had one of his officers or crew translate for him. The line of questioning included “What ship?, Where from?, Anybody wounded?, What cargo?, Have you any planes on board? [the answer to this was a deceitful no], Is your captain in the boat?” (again, “No,” a lie). Then Preatorius said “Sorry boys, this is war, we have to do it. Good luck,” or “I wish you good luck.” With that U-135 motored off over the horizon and was last seen at 9:50 pm by the survivors. Though there are some basic facts that are corroborated – torpedo strikes, men abandon ship, U-boat fires again, then motors off – the rest of the story, regarding the nearby tanker, is not substantiated at all, and thus the balance of the details must also be taken with a great deal of skepticism. It seems that the men on the Paderewski were overlaying recollections of several U-boat attacks into one, or that the Norwegian survivors were exaggerating (for whatever reason), or that elements of the story are simply fabricated years after the fact. When exactly the Pleasantville sank is not recorded, however by 10:30 the men in the lifeboats agreed to set sail to the west and the American mainland. During the first night one of the lifeboats became separated from the other two. Their first day in boats, Monday the 8th, was clear and calm with a slight sea, however they did not sight anything. The Captain’s boat held ten men: eight Pleasantville crew and two US Army passengers. Lifeboat # 5, the motor lifeboat, held 17 men and Lifeboat # 3 held 18 men for a total of 35 in those two boats. The following day, Tuesday the 9thof June at 4:05 pm the Captain’s lifeboat spotted the mast and funnel of a ship on the horizon to starboard. At 4:10 the ship altered course for the life boat. By 4:35 the ship was alongside and it proved to be the steamer Chickasaw City, which was bound for Trinidad. They were picked up 80 nautical miles west-northwest of where the Pleasantville had been sunk two days before. Captain Wildhagen said that the men were given the best care and food and that his crew performed “splendidly.” Eight Pleasantville officers and crew as well as two passengers were landed at 11:00 am on Thursday the 18th of June in Port of Spain, Trinidad. The American steam ship Chickasaw City which rescued a boatload of survivors from the Pleasantville on Tuesday the 10th of June 1942 and took them to Port of Spain, Trinidad on the 18th. The Chickasaw City was under the command of Captain John Walker Morton. She was a 6,196 gross-ton merchant ship built in 1920 by the Chickasaw Shipbuilding and Car Company in Chichasaw, Alabama. Her owners were the Isthmian Steamship Company of New York. On the night of 6th and 7th October 1942 the ship was sunk by U-172 under Kapitänleutnant Carl Emmermann between Cape Town and Trinidad. Though ten men perished there were 39 survivors and Captain Morton was among them, however he did not survive the subsequent sinking of the rescue ship Zaandam on 2 November 1942 when it was sunk by U-174 under Ulrich Thilo. The other two lifeboats had longer waits but similar rescue trajectories. On Monday the 8th of June they used their engine for 13 hours from 4:15 am to about 5 pm, towing the other boat west for the US coast. Without much fuel and wanting quiet at night so the men could sleep, they set sail at night. On Tuesday the 9ththey started the engine at 10:00 am and continued west. At 5:30 pm they spotted two marks on the horizon on the starboard side. They made for the ship, and at 6:30 pm the motor life boat was hoisted aboard the rescue ship. This process was repeated for the sailing boat (boat number 3) at 7:10 pm. They were 100 nautical miles west of where the Pleasantville had been sunk, and 275 nautical miles east-southeast of Cape Hatteras. The title for this image, in Polish, is “Rescuing survivors from the sunken ship.” The image appears directly above that of Captain Jerzy Mieszkowski of the Paderewski. It does not explicitly say that the men depicted are from the Pleasantville, nor does it say they are not. The fact that most of the men still have clothes and appear fairly healthy would suggest they were only in the boats a few days, as opposed to weeks. The shirtless man suggests tropical waters. The Polish motor ship Paderewski, which rescued 35 men and passengers from the Pleasantville roughly 280 nautical miles northwest of Bermuda on Tuesday the 9th of June, 1942 and took them to Trinidad. The rescue ship was the Polish steamship Paderewski under Captain Jerzy Mieszkowski. The ship was 4,426 gross tons and fairly new, having been completed in 1941 by the International Shipbuilding Company of Pascagoula, Mississippi. Her owners were the Gdynia-Ameryka Linie Zeglugowe SA (GAL) of Gdynia Poland. She safely delivered the 35 men from the Pleasantville (eight US Army officers and 27 merchant marine officers and crew), also to Port of Spain, Trinidad, where they would have been reunited with the ten others rescued by the Chichasaw City. On her voyage south the Paderewski delivered Jewish immigrant Dymitr Mytnik to Buenos Aires Argentina on the 31stof August, 1942. The Paderewski was sunk by Kapitänleutnant Günther Reeder in U-214 east of Trinidad on 30 December, 1942. Three were killed and 41 were rescued. From the sinking of the Pleasantville Praetorius and U-135 proceeded northeast and patrolled in zig-zag pattern for roughly a week north-northwest of Bermuda between the 11th and 17th of June. After that he headed due east, exiting the region on the 18th of June for France. After sinking the British steam ship Fort Qu’Appelle east of New York U-135 contributed to forming the line of seven boats in the Padfinder Group east of New York, looking for offshore prey. U-135 then proceeded to the area off Cape Hatteras, where it sank no victims. She was refueled by U-459 west of the Azores on the 16th of June according to Wynn, however in reality it must have been several days later, as U-135 was still north of Bermuda on the 16th. On the 5th of July U-135 arrived back in Saint Nazaire, a different base from that which she had departed (Brest). Holm Lawson, Dame Siri, without whom this essay would be sorely lacking. www.warsailors.com, specifically http://warsailors.com/singleships/norland.html. M/T Norland sunk by U-108/Scholtz: all 48 men rescued by 10 ships, 1 plane, attacked by U-boats 3 times, aided by U-boats 3 times….